There is something about winter that makes me crave comfort food. One of the things that has made successfully maintaining weight loss a lot easier for me is finding ways to convert traditional comfort food recipes into healthier versions. 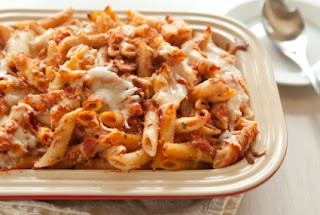 The recipe below is a healthier take on a pasta casserole that I adapted from a recipe from wholefoods.com. It is simple to make and also freezes great. By substituting whole wheat pasta, skim ricotta, and lean ground turkey, this recipe can serve to satisfy those comfort food cravings without breaking the calorie bank! If you are using ground turkey, brown the turkey with some onion and drain. Transfer pasta to the bowl with the cheese mixture and toss gently to coat. Stir in the ground turkey. Spoon the pasta mixture into the baking dish and spread out evenly. Drizzle remaining sauce over the top and sprinkle with mozzarella cheese. While I really enjoy this recipe, I have noticed that it can have a tendency to be a little bland if you do not add onions to the ground turkey or add some additional spices such as basil and pepper. I think that next time I make this I will use a more flavorful pasta sauce.